GH3D-380 | Size: 50 ml / 1.69 fl.oz. Dry and dehydrated skin is a very common condition (suffered by 15 – 20% of population) that occurs at all ages. Usually, it doesn't represent a serious problem but it can be uncomfortable and unsightly, creating fine lines and wrinkles. It is normally characterized by an excessive Trans-Epidermal Water Loss (TEWL) due to a deficiency in skin lipids (ceramides and free fatty acids). 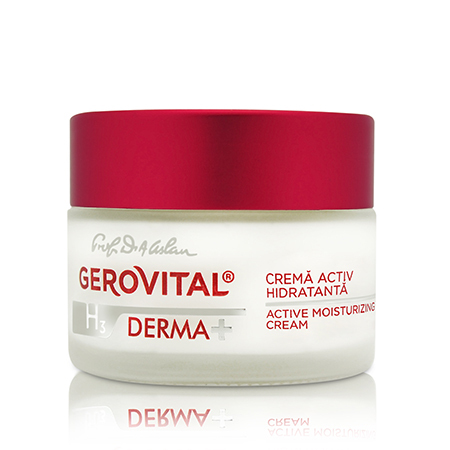 The Gerovital H3 Derma+ Active Moisturizing Cream is designed to restore the hydrolipidic barrier and balance out the deep moisture shortage of dry skin, stimulating cells’ ability to retain water. It incorporates high-performance active ingredients that help you delay aging signs. Sepilift™ DPHP - protects and reinforces skin structure, having a triple firming action: it stimulates remodeling and contraction of collagen fibers, protects elastic fibers against enzymatic breakdown and scavenges free radicals. Aquaxyl - moisturizes and restructures the skin by increasing the content of Hyaluronic Acid. Prevents dehydration by stimulating the production of ceramides and the synthesis of proteins. Apply in the morning and evening to the face, neck, and décolletage, on a cleansed and make-up free skin. Apply in the morning and evening to the face, neck, and décolletage, on a cleansed and make-up free skin. Use either by itself or after your usual serum. INGREDIENTS: AQUA, UREA, SQUALANE, CAPRYLIC CAPRIC TRIGLYCERIDE, GLYCERIN, CETEARYL GLUCOSIDE, CETEARYL ALCOHOL, PERSEA GRATISSIMA OIL, XYLITYLGLUCOSIDE, ANHYDROXYLITOL, XYLITOL, HYDROXYETHYL ACRYLATE/SODIUMACRYLOYLDIMETHYL TAURATE COPOLYMER, SORBITAN ISOSTEARATE, POLYSORBATE 60, DIPALMITOYL HYDROXYPROLINE, BUTYROSPERMUM PARKII BUTTER, PLUKENETIA VOLUBILIS SEED OIL, GLYCOSPHINGOLIPIDS, POLYGLYCERYL-5 OLEATE, PHOSPHOLIPIDS, TOCOPHEROL, HYDROGENATED PALM GLYCERIDES CITRATE, TOCOPHERYL ACETATE, CHOLESTEROL, PHENOXYETHANOL, ETHYLHEXYLGLYCERIN, GLYCERYL STEARATE, PARFUM, TETRASODIUM EDTA, SODIUM HYDROXIDE, BHA.